The announcement that rail fares are to go up by 3.1% in January has been met with frustration by passenger groups and trade unions. Anthony Smith, chief executive of watchdog Transport Focus, said "the rail industry cannot be short of funding" as passengers contribute more than £10 billion a year. He went on: "When will this translate into a more reliable railway and better value for money for passengers?" Mr Smith called for a "fairer, clearer fares formula" based on the CPI measure of inflation rather than the "discredited" RPI figure. The Rail, Maritime and Transport union slammed the January fare increase as "another kick in the teeth for passengers on Britain's rip-off railways". General secretary Mick Cash claimed British people will be paying "the highest fares in Europe on our rammed-out and unreliable services". He insisted the "only solution" is a publicly-owned railway "free from the greed of the private train companies". Alex Hayman, managing director of public markets at consumer group Which?, said passengers have "suffered horrifically" this year from timetable chaos and experiencedrail punctuality hitting its lowest level in 12 years. "These price hikes will only add to their misery," he warned. Mr Hayman added: "If the rail system is going to start working for passengers, not just train companies, then value for money needs to be a key part of the upcoming Government review and passengers must receive automatic compensation for delays and cancellations." 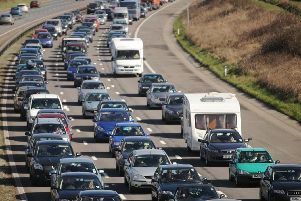 Transport Salaried Staffs Association general secretary Manuel Cortes said it was "annual kick-in-the-teeth time". Reacting to the rail fares announcement, he said: "New year rail fare rises are more reliable in Tory Britain than the weather or our beleaguered rail services. "Passengers deserve a break from this annual, legalised, privatised rail rip-off. "As commuters pack into their overcrowded trains again today they will be at a loss to understand why this Government thinks it's OK to carry on having chunky fare hikes dumped on them. "After a year of serious systemic disruption as the privatisation model falls apart, a fare freeze would have been appropriate, but once again hard-pressed commuters are being milked like cash cows into paying more money for less service - less seats, less staff and too often these days no trains at all." Shadow transport secretary Andy McDonald said 2018 has been "a painful year for railpassengers". "With little prospect of improvements in 2019, this latest above inflation fares rise will be felt even more deeply than usual," he said. "These increases show a Government and rail industry out of touch with passenger concerns."